Visit the Avalon for holiday shopping as well as holiday events with Santa and Mrs. Claus—there is something for everyone! Visit Avalon for holiday shopping as well as holiday events with Santa and Mrs. Claus—there is something for everyone! Mr. and Mrs. Claus will be spotted all around Avalon during the holiday season. Get cozy this holiday season with a bedside visit from Ole Saint Nick along with the ever-cheerful Mrs. Claus. Exclusive to rooms at Hotel Avalon, get the chance to elevate your children’s holiday memory with a bedtime chat, teddy bear hug and of course, milk and cookies with Santa, to lull your little ones right into a holiday slumber. There isn’t quite a gift like the that of childhood memories! Bring the whole family to celebrate a full day of free activities, festive music and an impressive display of lights amongst the buildings and trees of Avalon’s main plaza. This event marks the seasonal opening of Avalon on ice as well as the official lighting of Avalon’s 40-foot Christmas tree. Look out for DJ & Holiday performances spinning Yuletide hits, family fun with North Point Community church and a performance from Bogey and the Viceroy, returning for their fourth year! 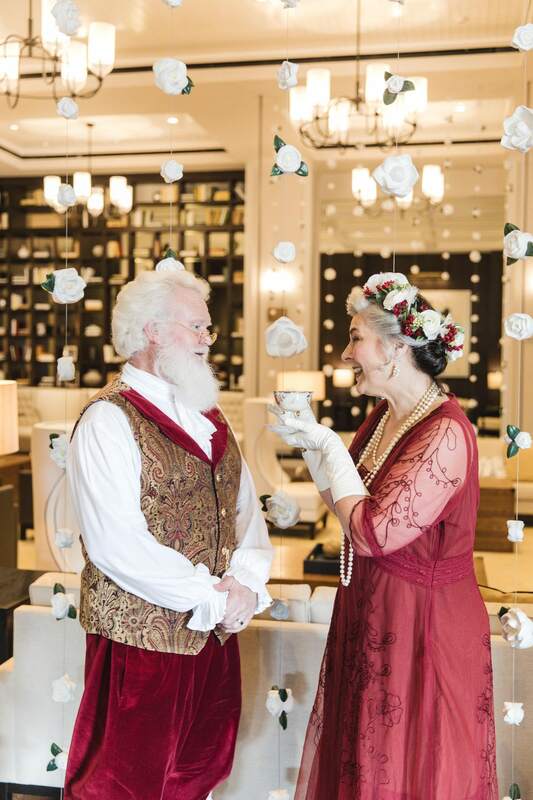 Dress and press your holiday best for a traditional afternoon tea with Mrs. Claus. Fineries like linens and china will be set in the salon of Hotel Avalon, and young ladies and gentlemen are invited to enjoy sweet tea and cookies while adult guests are treated to assortments of fine teas, sweets and savory bites. The fun doesn’t end at tea of course, little ones are invited to indulge in crafts including writing letters to Santa and story time! Hosted by Mr. and Mrs. Claus, breakfast is the most important—and now most memorable—part of your little ones day! Allow your kids to rattle off their Christmas wish list over a Southern spread of eggs, grits and waffles while also enjoying holiday crafts, story time and jolly tunes. They will leave with full tummies and happy hearts. Each Monday starting Nov. 12, Avalon will be releasing amazing giveaway experiences from multiple retailers and restaurants in the Avalon family. To win, guests are asked to donate $25 to benefit The Drake House though Avalon’s partnership with Northside Hospital. What better way to celebrate the holiday season other than giving and receiving! Early bedtime? No problem, Hotel Avalon is here to kick off your New Year’s celebration, a couple hours early! This family friendly event invites guests and partygoers to ring in 2019 at high noon, including live music, face painting, crafts and even a ballon drop! Best way to toast the new year AND get your beauty rest.